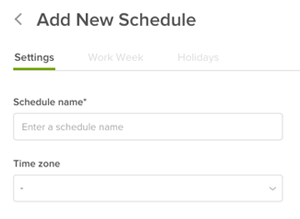 If you're on Professional or Enterprise, you can set a schedule for your Zendesk by selecting a time zone, defining business hours, and setting up holidays. Note: On Professional you can set only one schedule. On Enterprise you can set multiple schedules. If you don't provide 24/7 support to your customers, you can acknowledge your availability and give customers a better sense of when they can expect a personal response to their support requests. Even if you do provide 24/7 support, you can enhance your workflow by setting up views, triggers, automations, and reports based on your business hours set in your schedule. Note: Zendesk Support schedules do not apply to Chat or Message operating hours. See Creating a schedule with operating hours for Chat and Setting up operating hours for Message. Watch the video below to learn how schedules can impact customer experience and team reporting. Your schedule includes a time zone and specific business hours each day in a weekly schedule for Zendesk Support. You can also set up holidays as exceptions to the business hours set in your schedule. You can add as many holidays as you like, and they will be treated as outside of business hours and not count toward any metrics you measure in business hours. After you set a schedule, you can create business rules based on the business hours in your schedule. You can also use business hours in reporting. Click the Admin icon ( ) in the sidebar, then select Settings > Schedules. (Enterprise only) Click Add schedule and enter a Schedule name and select a Time zone, then click Save. Click the Work week when you finish the settings. Keep the preset business hours or modify the business hours and click Save. To move a block of time, drag the time block up or down on that day. To change the start or end time, drag the top or bottom of the time block. To remove hours from a day, click the X in the upper-right corner of the time block. The day changes to Closed. To add hours to a closed day, click anywhere on the closed day. A time block appears where you clicked. The hours you set are relative to the time zone set for your Zendesk (unless you are on Enterprise, and you selected another time zone for your schedule). See Setting the time zone and format for Zendesk Support. Click Holidays, then click, Add holiday, if you want to set any holidays as exceptions to your scheduled business hours. Note: You can schedule holidays up to two years in advance. Enter a Name for the holiday, then click in the first date field to pick a start date, and click in the second date field to pick an end date. You can choose a single day (by picking the same start and end date) or a date range (by picking different start and end dates). You cannot set a partial day holiday. Click Save, then click Add holiday again to add multiple holidays to your schedule. The holidays you add appear in your list of holidays in chronological order. Simply click in the expanded holiday to collapse it. For information about managing your holidays, see Managing your holidays. (Enterprise only) Click the back arrow to return to the Schedules admin page, then click Add schedule again if you want to set multiple schedules. Note: If you set up multiple schedules, you must create triggers to apply your schedules to tickets (see Applying your schedules to tickets (Enterprise). Now you can use business hours in business rules, reports, Talk, and Liquid markup. For more information about business rules and reporting based on business hours, see Creating business rules based on business hours and Reporting based on business hours.For information on assigning Zendesk Support schedules to individual Talk numbers, see Using multiple schedules for Talk. Talk numbers with a Zendesk Support schedule will only route calls during Zendesk Support scheduled business hours. Tip: If you added holidays, be sure to check out Liz Rosen's community tip, Holiday auto-responses made easy. You can delete a schedule if you need to. When you do so, it's immediately removed from your account, and your Zendesk will use calendar hours, unless you have another schedule in place or add a schedule back to your account. If you want to stop using business hours in your account, remove all schedules. Your scheduled holidays appear in chronological order in your holidays list. You can click any holiday to expand it and show details or to collapse it and hide details. Your upcoming holidays are shown by default, but you can filter by past holidays. You can edit, delete, or clone any upcoming holidays. You can clone any past holidays. (Enterprise only) Click the name of a schedule on the Schedules admin page. Click to expand the holiday you want to edit. In the Holidays tab of your schedule, click the options menu beside the holiday you want to delete, then select Delete. Click Delete holiday to confirm the deletion. The holiday is removed from your list of holidays. In the Holidays tab of your schedule, click the options menu beside the holiday you want to clone, then select Clone. A new holiday with the same name appears in your list of holidays, expanded so you can edit it. Enter a new name and select new dates for the cloned holiday. In the Holidays tab of your schedule, click Upcoming holidays, then select Past holidays. When you create multiple schedules for Zendesk Support, the first schedule that you create, and the one that appears first in your list of schedules, is always your default schedule. Your default schedule is used for all tickets, unless you set up a trigger to apply a specific schedule to specific tickets. You need to create a trigger for each schedule you want to use for your tickets. Click the Admin icon ( ) in the sidebar, then select Triggers. Select Add Trigger, then enter a title for your trigger. Add conditions for your trigger. The conditions will determine which tickets get the schedule you set in the next step. For example, you might chose the condition ticket group is to set a schedule for a specific group. Or you might decide to set the schedule based on the ticket's brand or status. It's up to you. Add the action Ticket: Set schedule, then select one of your schedules from the drop-down list. If you need to find out which schedule is applied to a ticket, you can view that ticket's events (see Viewing a ticket's audit trail). You can create views, SLA policies, triggers, and automations based on your business hours. You can create triggers based on holidays. Any views, triggers, or automations based on business hours also take scheduled holidays into account, and consider them as outside of your business hours, unless you have set up a holidays trigger. Note: If you are on Enterprise and have multiple schedules, triggers, SLA policies, views, and automations based on business hours will use the schedule applied to the ticket. You can also use the Liquid placeholder for business hours in macros, triggers, and automations. For information see Using Liquid markup. Then, select one of the "(business)" options to calculate time based on your business hours. (Enterprise only) If you are on Enterprise and have multiple schedules, views based on business hours will use the schedule applied to the ticket. For information about creating views, see Using views to manage ticket workflow. You can create triggers based on business hours using the "Ticket: Within business hours" condition. This enables you to build triggers that fire based on whether an event occurs during business hours or outside of business hours. 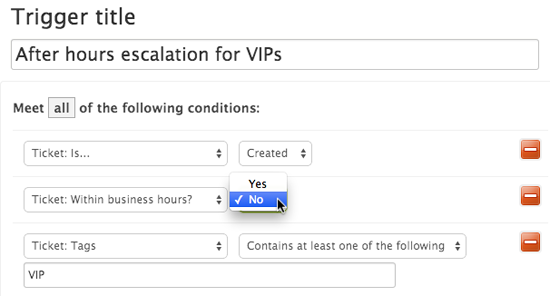 For example, you might create a trigger to escalate a ticket filed by a VIP customer outside of business hours. (Enterprise only) If you are on Enterprise and have multiple schedules, triggers based on business hours will use the schedule applied to the ticket. For information about creating triggers, see Creating and managing triggers. (Enterprise only) If you are on Enterprise and have multiple schedules, automations based on business hours will use the schedule applied to the ticket. For information about creating automations, see Streamlining workflows with time-based events and automations. You can create triggers based on holidays using the "Ticket: On a holiday?" condition. This enables you to build triggers that fire based on whether an event occurs during a holiday. This condition is set to yes for the full day of the holiday, not just during your normal business hours that day. For example, if you have a Monday holiday and your normal business hours on Mondays are 9am to 5pm, the holiday is considered the full calendar day, including hours outside of your normal hours, such as 10pm. (Enterprise only) If you are on Enterprise and have multiple schedules, this condition respects the list of holidays set in the schedule applied to the ticket. You can create triggers based on multiple schedules. Use the "Ticket: Schedule" condition to build triggers that fire based on the schedule applied to a ticket. Use "Ticket: Within schedule" condition to build triggers that fire based on a selected schedule. You can use the "Ticket: Set schedule" action to apply a schedule to a ticket. For more information, see Applying your schedules to tickets. You can build Insights reports based on business hours set in your schedule. If you are on Enterprise and have set up multiple schedules, reports based on business hours use the schedule that is set for the ticket (see Applying a schedule to your tickets). To find out which schedule is applied to a ticket, you can view that ticket's events (see Viewing a ticket's audit trail). Note: Any report based on business hours also take scheduled holidays into account, and consider them as outside of your business hours. You cannot build reports based solely on holidays. Note: For definitions of these metrics, refer to the Insights object reference. For information about Insights see the Insights resources page. We are trialling Zen Desk plus - and I am unable to set business hours and holidays. I have toggled "enable business hours" but everytime I leave the page and return my changes have reverted despite it saying "saved". What am I doing wrong here? Hi, are business hours (or custom schedules) exposed through the API at all? Specifically, I'd like to be able to do what @Jeanette mentions above - display business hours on a form. Why don't you give an option to buy Multiple Schedules as an add-on? Upgrade to Enterprise would double the expenses and it wouldn't give any other value for us with Plus (~Professional) plan except for this..
We have a professional license and based on the article I take it that we only have one schedule available so in my case where we have an agent in Western Canada and an agent in Eastern Canada we will not be able to accurate use the business hour? There is a 3-hour time different between the two ends of Canada. We have business hours enabled and an 8am - 5pm, M-F schedule set. However, when pulling metrics from Insights on Friday then reviewing those same numbers the follow Monday, I'm reasonably confident those business hours are not recognized. It's clear night and weekend hours are being considered. Beyond the enabling business hours, is there something else I need to configure? Check the metrics you used in your report. There are calendar hours-based and there are business hour-based metrics. In order to use the business hour properly you need to pick the metrics that calculates based on business hours; there is usually a [Biz Hr] in front of the metrics you can select. A condition for 'in business hours' would be great for Automations too. We have a number of automations that we using business hours, so should not run until we are in hours again, however my systems for delaying notifications fail on a few levels. If I have a requirement for the ticket to be open to run... as well as the business hours condition... if business hour condition is triggered, but the ticket is closed, then reopens outside business hours - it will run. So I put a condition based on latest update by requester... but if a CC updates the ticket, it fires. If I use a condition based on any update it works , but what if I don't want that? Also if an agent other than the requester updates the ticket this can cause the same issues. I want to set office hours as per the groups, as there are teams that work in different countries and have different work schedules. Please let me know if that is possible and if yes then how can we set those. If you're on the Enterprise plan you'll have the ability to create multiple schedules by selecting Add Schedule under Admin>Settings>Schedules>. If you're on the Professional plan you'll be limited to one schedule. You can then apply schedules to tickets using Triggers as mentioned here. The conditions will vary based on your workflow but hopefully this gives you a better idea of how to set this up. On Enterprise, we want to only fire off CSATs within a certain window. I created a CSAT Schedule. However, I can't get the Automation to run off the CSAT schedule. The ticket needs to stay set on our usual Business Hours Schedule for normal ticket processes. We just want the CSAT Automation to fire off between certain hours on certain days... Can't seem to get that to work. We will most likely need to take a look at some ticket examples as well as the automation conditions you've set up on your account. I'm going to get a ticket created on your behalf and passed over to our Support team so they can follow up with you. I want to create a view for my agents based on a fixed time as to when the tickets came in. For instance, I want a view that shows all tickets older than 9am from today. Once this view is set, after 9am, it shouldn't increase. Currently, I have to change the view every hour as it is set "Calendar: More than: (# of hour difference to 9am)" to set it for the appropriate time. Please let me know if it's possible to set a fixed time so I don't have to keep changing it every hour. I'm afraid there's no view condition that will look at the hour a ticket was created unfortunately. The best alternative I can think of is if you have multiple schedules available on your current plan, then creating a schedule specifically for before 9AM and one for after 9 AM. After the above is set up you can then create a view that shows any tickets that contain that tag. I realize this may not be the solution you're looking for but I do hope it helps!